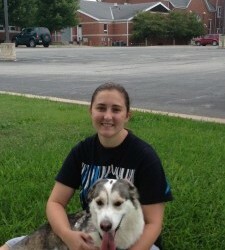 Sasha and I on a walk on campus. By Dani Moritz About two months ago, my fiancé, Alex, and I adopted a dog from our local animal shelter and, let me tell you, it’s been quite the journey! Sasha is a Husky mix with a mysterious, dreadful past.